Ready-to-use reagent kit to determine ploidy level with a two-step protocol. Using the kit components for nuclear extraction and staining of nuclear DNA from plant tissues, genome size variations and ploidy levels can be determined. 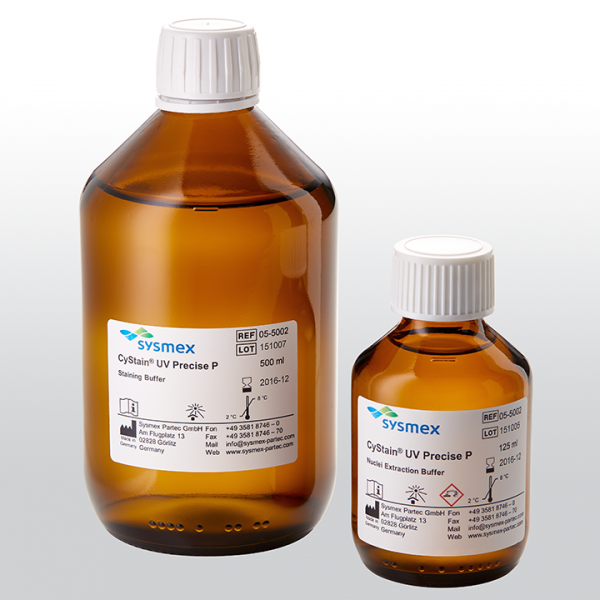 The reagent has been created specifically for selected configurations of the Sysmex CyFlow® Ploidy Analyser and CyFlow® Space flow cytometers. Atri C. & Banga S.S. A protocol for flow cytometric determination of expected chromosome number of Brassica juncea L. introgression lines. Journal of Oilseed Brassica (2014); 5 (2): 170-174. De K.K. ; Saha A.; Tamang R. & Sharma, B. Investigation on relative genome sizes and ploidy levels of Darjeeling-Himalayan Rhododendron species using flow cytometer. Indian Journal of Biotechnology (2010); 9: 64-68. Matsuda M.; Iwata Y.; Koizumi N. & Mishiba K.I. DNA double-strand breaks promote endoreduplication in radish cotyledon. Plant Cell Reports 2018; 37(6): 913-921. https://doi.org/10.1007/s00299-018-2278-5. Nasution O.; Sitorus A.C.; Nelson S.P.C. ; Forster B.P. & Caligari P.D.S. A high-throughput flow cytometry method for ploidy determination in oil palm. Journal of Oil Palm Research (2013); 25 (2): 265-271. Padoan D.; Mossad A.; Chiancone B.; Germanà M.A. & Sha Valli Khan P.S. Ploidy levels in Citrus clementine affects leaf morphology, stomatal density and water content. Theoretical and Experimental Plant Physiology (2013); 25 (4): 283-290.